Kathy Guthrie, M.S. ’00 was presented with the inaugural Outstanding Service to Student Affairs Profession Award at the Illinois State University Alumni and Friends Reception during the 2019 National Association of Student Personnel Administrators (NASPA) Annual Conference in March. This new award is given to an Illinois State University graduate in the field of student affairs or higher education, who exhibits practices that reflect the values of the Division of Student Affairs. These values include mentoring students and professional colleagues; demonstrating an appreciation for life-long learning and professional development; applying knowledge, experience, and resources to create educational environments beneficial to students’ development; collaborating with colleagues; and contributing to the student affairs profession through regional, state, or national professional associations. Guthrie received her master’s through Illinois State University’s College Student Personnel Administration program in the Educational Administration and Foundations department. During her time at Illinois State, she served as a graduate assistant in the Office of Student Life, currently known as the Dean of Students Office, coordinating leadership and service programs and consulting on department assessment efforts. Service to students is a top priority for Guthrie. She has dedicated a significant amount of her professional work to mentoring students seeking degrees in higher education. In her current roles at Florida State University as director of the Leadership Learning Research Center and associate professor of Educational Leadership and Policy Studies, Guthrie mentors students of all levels, from undergraduates to doctoral students. Using her creativity and active, engaged teaching style, she is a positive force in students’ lives. Given her prior work experience advising students, these roles are perfectly attuned to her skillsets. She has the ability to blend her vast scholarly knowledge with a caring and humanistic approach. Guthrie’s passion to nurture students strongly correlates with the research she performs, centered around leadership education, with a focus on inclusion and culturally relevant leadership. She provides a unique perspective, connecting her scholarly work with her practical knowledge gained from being a practitioner. Since completing her doctorate a decade ago Guthrie has excelled quickly in her career. Among her most notable accomplishments is her development of twenty new courses and an undergraduate certificate in leadership studies. Further, Guthrie has contributed an astonishing amount of research to the student affairs profession and higher education, having authored over thirty articles, chapters, and books. Guthrie’s commitment to service extends to her involvement in professional associations. She holds diamond honoree status with the American College Personnel Association (ACPA) and has also made significant contributions to NASPA and the International Leadership Association. Guthrie has presented across the nation, both individually and with colleagues, making sure to reflect different voices and a broader collective. Guthrie has devoted her career to higher education and student affairs and displays a strong commitment to lifelong learning. Her teaching, research, and service clearly demonstrate her values in action. 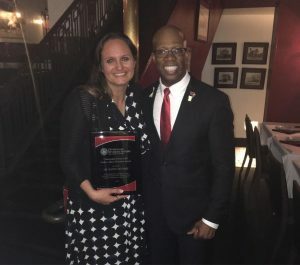 The student affairs field benefits greatly from Guthrie’s scholarly and practical contributions, and the Division of Student Affairs at Illinois State is proud to honor her with the inaugural Outstanding Service to the Student Affairs Profession Award.